The European Day of Languages, organised by the Representation of the European Commission in Malta and coordinated by the Għaqda tal-Malti – Università, will be celebrated on Saturday, 27th September in Bay Street, St. Julian’s. During the day cultures and languages across Europe and beyond will be celebrated by a number of entities thanks to stands situated on the different floors of the complex and activities at various times for everyone. The activities shall start at 10am and end at 6pm. 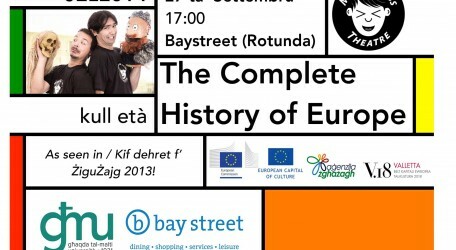 The main and last event of the day during the day will be The Complete History of Europe (More or Less); a show brought to you by Malcolm Galea and Joseph Zammit (More or Less Theatre) which was a hit during last year’s ŻiguŻajg. During the show, which will last about an hour, the comical pair will use a number of costumes and props to entertain the public with their energy and charisma. This will be of interest to children and youths, who always study history academically, and to adults so that everyone can get to know more about cultures. The show is free of charge and will be held on the ground floor of Bay Street. Thanks to this activity, the day will come to an end with a light yet educative performance. This activity, which ought not to be missed, will start at 5pm. See you there!